Forge Motorsport Transmission Cooler NISSAN - Pann Auto Performance - San Diego largest aftermarket automotive performance parts - What do you drive? The cooler itself is a massive 25 row 235mm wide Mocal unit, fully ducted into the spare duct on the front bumper which improves the coolers efficiency. It’s fed by braided -8 lines and Aeroquip hose aluminium hose ends. The pump is Mocal’s own, delivering an amazing 5 litres of transmission oil every 30 seconds to the cooler – enough to completely change the oil in the transmission every minute! The transmission cooler is thermostatically controlled so only comes on when the transmission oil reaches 100 deg C (212 deg F), and turns off again at 95 deg C (203 deg F). 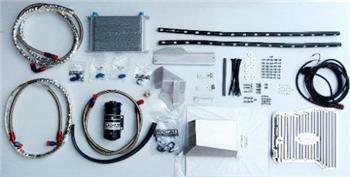 This allows the transmission to reach a temperature that burns off any water based contaminants in the oil (e.g. condensation) before the cooler cuts in. This is a COMPLETE kit – all nuts/bolts/brackets are included, together with a genuine Nissan sump gasket, and a bespoke wiring harness with all the connections pre-made. A CD is included that provides a full colour installation guide around 40 pages long. This cooler adds 2 litres of oil to the system so please take that into account when you are purchasing the oil for this installation.